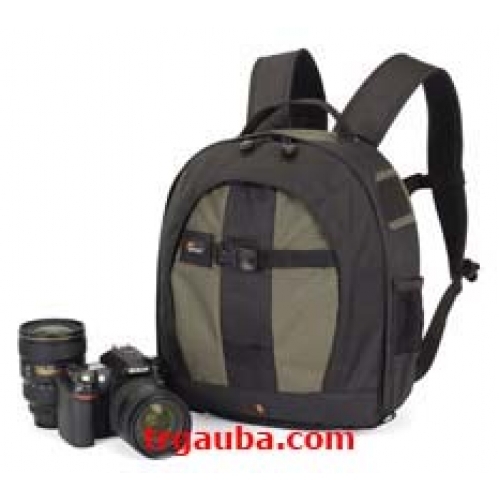 The Lowepro Pro Runner 200 AW Backpack (Black) is designed to carry and protect a digital SLR camera body with attached lens (up to 70-200mm f/2.8) plus 2-3 additional lenses or flash, accessories; tripod or monopod and personal items. It is made from weather-resistant 600 denier square rip-stop polyester with a padded interior plus removable, padded inserts and adjustable dividers. The pack has an All Weather AW Cover that protects the camera gear from the elements. It also has rain flap lids that covers the zippered closure and offers added weather protection. There is a Hideaway Tripod Mount with foldout holder that secures a compact tripod or monopod. The SlipLock attachment loops will allow the addition of optional accessories. The Pro Runner 200 AW has a front organization pocket that offers quick access to personal items such as, a light jacket, cell phone or an MP3 player, an inside lid with memory card and organization pockets and mesh side pockets. It is carried by adjustable, padded shoulder straps with a moisture-wicking, thickly padded back pad and a tuck-away waist strap.